Incredible card! Up for auction this month is a breathtaking PSA 9 Red E98 Honus Wagner, which stems from the famous Black Swamp Find. This monumentally impressive card which was found in Ohio along with many other uncirculated cards from the highly admired Standard Caramel like issue. The card in just a few words is 'brand new' and possesses all the eye appeal and qualities of a GEM MINT card. Virtually dead centered with four untouched corners and pristine edges. The surfaces are exceptionally beautiful with zero print imperfections, glowing color and perfect clarity. The Black Swamp Find shocked the tobacco era trading card marketplace, producing cards of quality and preservation completely foreign to investors familiar with the era. In fact, this find produced seventy-four PSA 9 examples, prior to which zero had been recorded. The T206 Honus Wagner is perhaps the most coveted Baseball card in existence and with these copies being virtually impossible to acquire, the importance and desirability of the offered specimen is difficult to overstate. 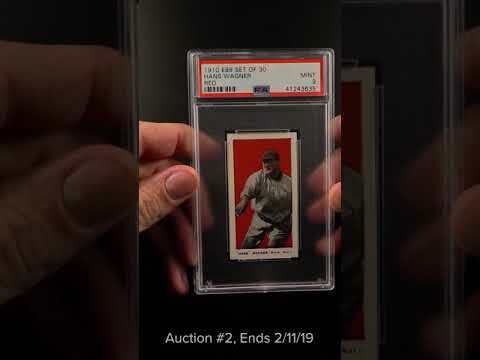 For many investors specializing in early candy cards or Honus Wagner himself, the offered E98 Red example sits among the pinnacle. An all around stunning card which is being offered free of any reserve. Comes highly recommended by PWCC. One of over 15,000 cards, lots, and sets up for bid in our 2nd Auction of 2019. Click on the link above to view the other PWCC auction lots. The PWCC Vault is now live! Open a PWCC Vault account and receive a custom Vault shipping address. Purchases shipped to the Vault receive free shipping and reflect Oregon's 0% sales tax rate.